Just got this today from a friend. The leaves are about 20+cm or nearly a foot long by about 5-7cm(2-3 inch) wide. The leaves are a dark green and look fairly thick. The top leaf is shiny and has a polished look. Apparently the friend has been taking care of it for a year in a plastic pot that doesn't have any holes. I'd like to know what this orchid is and any suggestions for taking care of it. Particularly how much sunlight it should get. Additionally, I'd like to know how much tolerance it has for humidity or temperature and whether or not I can/should mount it. 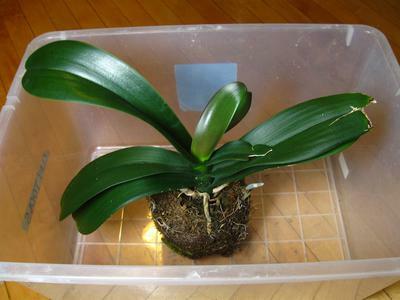 This looks like a Phalaenopsis. It will do well with relatively low light (such as an East window), and is fine with a fairly wide range of temperatures and humidities. You should water just as it approaches dryness. They do really well mounted! But you'll have to be able to water a lot more frequently -- often daily. The moss looks like it's getting old, so it's probably time to repot. If it's been sitting in water regularly, you may find that most of the roots have rotted. If so, you'll just have to be patient while the plant recovers. 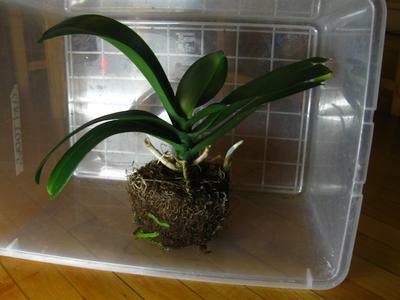 Fortunately Phals are pretty tough, and the leaves look healthy.